We sat down to dinner at an open-air restaurant just south of Puerto López, Ecuador. It was a quiet night, with a pleasant ocean breeze coming in from the Pacific. The waves crashed rhythmically against the face of the cliff far below. A thick row of tropical plants separated our table from the adjacent walkway, which worked its way down the cliff to the beach. The waiter had just finished uncorking the wine. But the peace was shattered as the large head of a wild burro burst through the hedge and positioned itself over the table. She snatched a large mouthful of fresh-cut flowers from the centerpiece, chewed them for a few seconds, and then withdrew her head into the darkness. A few minutes later, she reappeared at the romantically lit swimming pool, where she took a long drink before moving off into the night. It turned out she was a local mascot, and I’m sure we weren’t the first visitors to be surprised like this. This instance says a lot about the Ecuadorian coast. You can find beautiful beaches all over the world, but you won’t find many with Ecuador’s natural appeal and untamed character. And the good news today is that there’s a classic “path of progress” investment shaping up in the town of Playas thanks to a major infrastructure upgrade and the coast’s largest development project. The Ecuadorian coast has always offered a lot…but now we can add a solid investment potential to its list of many benefits. As the name implies, Ecuador sits on the equator, at the 10 o’clock position in South America. It’s amazingly popular with expats today because of its dramatic natural beauty, nonintrusive government, and very low cost of living. And it’s easy to qualify for residency in Ecuador. As a pensioner, you only need an income of US$800 per month. An investor visa requires just US$25,000, which may be your residence or one of several financial instruments. Follow the link for full details on obtaining residency in Ecuador. The town of Playas sits on the Gulf of Guayaquil (on Ecuador’s south-central coast) where it enjoys a relatively sheltered location from the Pacific’s fog and cold water. Its 24,000 residents work mostly in the fishing and tourism industries. The weather and the ocean in Playas are always warm and pleasant. You can expect high temperatures in the 80s, with lows in the low-70s. Most rainfall occurs between February and April, but even then, you’ll usually see sunny mornings with afternoon showers. 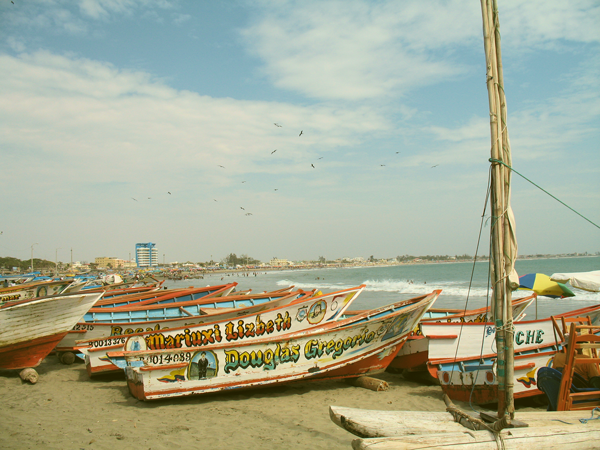 Its “fishing village” character: I’ve often said that Playas can’t make up its mind whether it’s a fishing village or a resort, which makes for a great beach experience with a homey and culturally rich feel…not to mention the fresh and inexpensive seafood available here. Warm, calm waters: Since Playas is located within the Gulf of Guayaquil—43 miles inland of Ecuador’s western tip at Salinas—it’s usually protected from the Pacific’s rough and cold waters. What’s more, Playas is on a small bay within the gulf, which protects it even more. Sunshine: Most of the Ecuadorian coast is overcast for a significant part of the year—roughly from May to November. Exactly how much sun you get can vary from one spot to the next, and can change very quickly as you travel. But in my experience, Playas is somewhat immune from the overcast, thanks again to the warmer waters in Gulf of Guayaquil. Playas claims 320 days of sunshine per year and it’s the only place on the coast where I’ve seen sunshine every time I’ve visited. Proximity to the airport: Playas is Ecuador’s most accessible beach, at 60 miles (97 km) from the airport in Guayaquil—a drive that will take you 1 hour, 17 minutes. (The popular beach town of Salinas claims to be just about as close…a feat apparently accomplished by not counting the first 56 km of the trip.) Beaches in Ecuador can be as far as six hours from the international airports, so this proximity has always been a strong selling point for me. If Playas had a traditional down side, it was that there wasn’t much to do there aside from beachcombing, swimming, and eating fresh seafood at one of the beachside seafood shacks. Restaurants and accommodations were very basic and limited in number. Playas is located in the Ecuadorian province of Guayas and is the province’s primary beach resort. But this distinction used to be held by larger and more-popular Salinas, until Salinas broke away and became part of the new province of Santa Elena in 2007. Having lost its money-making resort, the province of Guayas turned its attention to Playas. As home to Guayaquil—Ecuador’s largest and wealthiest city—Guayas had significant resources to direct at Playas’ infrastructure and development in an effort to outdraw Salinas in the competition for developers, investors, and beachgoers. The result has been a major US$60 million upgrade in Playas’ infrastructure…including the roads to get there. What’s more, there’s even a brand-new beachfront shopping mall which is further evidence of today’s increased investor confidence. Playas is not yet a place to invest for rental income. The market is still limited, and there are better, more-mature places to do this on the coast—places like Salinas, mentioned above. But today—in typical “path of progress” investing fashion—the improved access, infrastructure upgrades, additional amenities, and increased tasteful development are all having their effects on property prices. Ten years ago, they were almost giving property away in Playas. Today, prices are starting to rise to reflect its change in stature and intrinsic value. 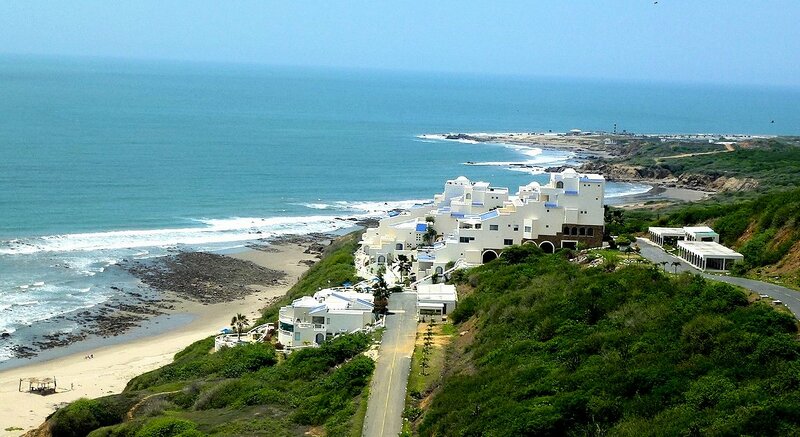 Accordingly, Playas is one of the best places in Ecuador to invest for capital gain. This is a newly emerging area, and prices are still low on the curve. Mega-developer Pronobis is just beginning the US$700 million Karibao project a few miles outside of Playas. Karibao is a Caribbean-style destination resort and residential development capable of housing a total of 10,000 people, and will have its own restaurants, shops, bakeries, pharmacy, supermarket, gas station, and spa…along with a golf course and artificial lake. They’re targeting the expat market, and the fact that they chose Playas for the project says a lot about its intrinsic desirability and climate. As this project progresses, the real estate picture in the Playas market will change forever. Here are some good values on today’s market. One of my favorite properties is in the very-popular Casa Blanca project, offering 2 bedrooms, 2.5 baths, and an incredible ocean view. The 1200-square-foot property (112M2) comes with two covered parking spaces and two storage rooms, while the facility has a large pool. The asking price is US$149,000. If you can spend a bit more for an even better ocean view, there’s a large apartment for sale offering an impressive 1,800 square feet of living space (167M2), plus an additional 675 square feet of deck space. The two westward-facing decks—one off the living room and one off the master bedroom—are both perfect for watching the Playas Pacific sunsets. The 3 bedrooms each have a private bath, and there’s also a maid’s quarters with its own private bath. The asking price is US$245,000. The best bargain I’ve seen in Playas is a 3-bedroom condo across the street from the beach, with a nice ocean view. The unit comes with covered parking and a storage room, and the building’s lap pool and Jacuzzi are located just outside the door to this unit. It’s convenient to the beach and the new mall, along with a number of coffee shops and cafes. Taxes are under US$250 per year, and utilities are less than US$50 monthly. At an asking price of US$82,900, this one will no-doubt go for less than US$80k. Before considering Playas, remember that it’s a small town, so for things like orchestra, theater, and a large selection of fine dining you’ll need to head to Guayaquil, an hour away. Playas is long on fresh seafood and full-course lunches for US$2.50…but short on white tablecloths, maître d’s, and extensive wine lists—at least until these things open in the Karibao project. Also, at this point in its development, Playas is primarily a vacation-home destination, so you won’t have a lot of full-time residents. It’s a great place to relax and walk the beach…but most of your full-time friends will be local at this time. Costs of ownership here in Playas are quite modest. Of the properties I looked at for this report, taxes started at US$76 per year, and peaked at about US$400 per year. Homeowner association fees are generally low—less than US$100 per month—if you pay any at all. My primary real estate contact on Ecuador’s coast for more than 10 years has been Mike Sager, who has a home in Playas. Follow the link to see his Ecuador Properties website ( http://www.ecuadorhomesales.com/ ), or write to him here. Mike not only sells coastal real estate, but also hosts coastal real estate tours. My preferred attorney is Grace Velastegui, who has done all of my legal work since I met her in 2002. If you’re looking for an upscale resort reminiscent of Puerto Vallarta, Cancun, or Punta del Este, then Playas won’t fit the bill. But if you’d like a simpler, more relaxing lifestyle—with inexpensive beach properties and a good chance to ride the current wave of development—then Playas may be just right for you. It’s a great place to enjoy fishing, swimming, beach walks, and good seafood just an hour from Ecuador’s largest city and all its amenities. I like your newsletter but I don’t see much about Costa Rica. Tell me how you compare Costa Rica with other Central and South American countries. I think Costa Rica is one of the world’s most beautiful countries and their care for the country’s natural beauty and environment is a cut above the norm in my Latin America experience. Parts of the country have become quite expensive…but you can still find very reasonable properties and a low cost of living by staying out of the dense expat areas and luxury developments. My personal favorites are the towns and countryside around Lake Arenal, the central valley between San José and San Isidro, and the southern Pacific coast. I like the idea of agro-investment, but would like to have my own farm. We are selling our almond ranch of 20 acres, which my husband has to work himself in order to turn a profit. Any ideas for under US$250k cash? We have a history of successful farming. For a hands-on farming operation, my favorite is still Uruguay. It’s a modern country, with a sound financial system and a mature farming industry that’s complete with an export infrastructure. And thanks to the government’s productivity rating system, buying productive farmland is more secure than anywhere I’ve seen. But more importantly, Uruguay sits squarely on the continent’s main aquifer, so you’ll find not only excellent farmland, but plentiful water as well. It’s also one of the most-pleasant countries in the world in which to live. Follow this link to see a brief presentation on buying farmland in Uruguay ( http://www.fs.com.uy/media/pdf/Farmland-in-Uruguay-2014.pdf ).